When you’re in need of a really good shackle specially designed for the job you have in mind, a stainless steel dee shackle – safety bolt from Rope Services Direct might well help. Our E type safety shackles are designed and made in the United Kingdom from Stainless Steel EN10088 1.4401/4. They’re created to the most rigorous safety standards using the very latest in forging technology and attempts must not be made to distort or bend the shackle out of shape as this will negatively affect its structural integrity. Our stainless steel dee shackle – safety bolt types are made with marine type stainless steel so are ideal for all conditions as they won’t break down, rust or degrade. Not only does this offer a particularly durable shackle, it allows them to be used for a broad spectrum of sporting, mechanical and marine purposes. They’re perfect with our lifting slings too. As stainless steel is liable to stress marking over long periods, we strongly advise that you thoroughly check and maintain your shackles regularly. From our spacious warehouse near Dudley, at RSD we are proud to supply a phenomenal range of parts for everything you could possibly need. Whether you wish to use your shackle with a chain sling or one of our fibre ropes, we bet you’ll quickly find the one you need at RSD. If you’re looking to inform us of your order, please do so here. Need some help? Chat to the team today – it’s 01384 78004. 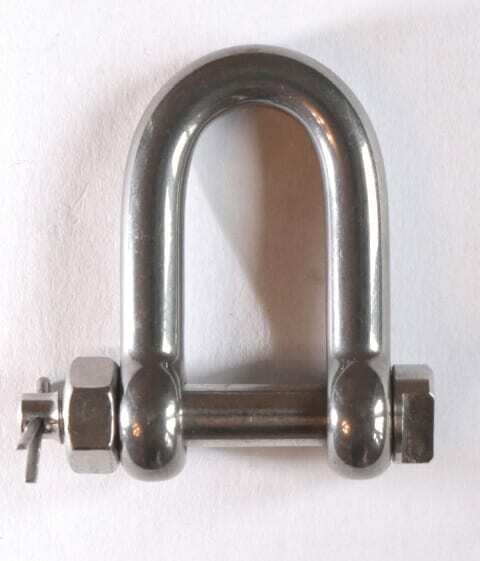 Stainless Steel Dee Shackle - Safety Bolt Overall rating: 5 out of 5 based on 6 reviews.